I’ve been long interested in the unforeseen influences (both positive and negative) of technical innovations, especially in the computational realm. Here’s a cute example that’s somewhat playful, but still highlights the need to stay aware of unexpected outcomes when introducing new technologies into organizations and societies. After finishing my doctoral work, I returned to Stanford Medical School to finish up the MD part of my MD/PhD. 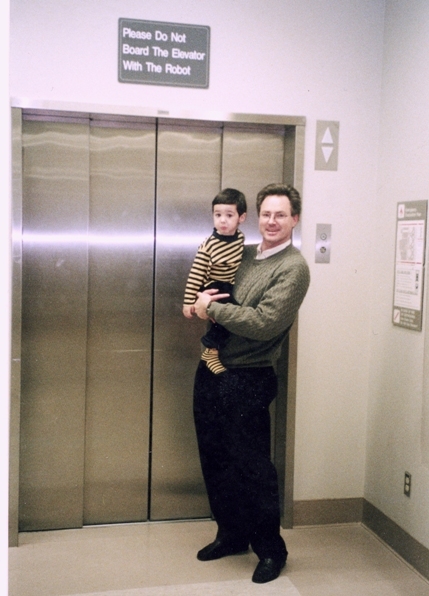 During one of my last clinical rotations, I stopped to take an elevator up to a surgical unit. While waiting for the elevator, a large washing-machine-sized robot—a unit that had then been recently introduced at Stanford Hospital to pick up and deliver x-ray films—pulled up along side me. After waiting patiently together, we both entered the elevator. As the door closed, the robot began to whir and then quite rapidly spun around 180 degrees to re-orient itself for exiting. The large spinning robot nearly knocked me down in the elevator. It was somewhat frightening to be trapped in an elevator with little clearance for a massive spinning robot. I recall being somewhat concerned about what might happen if a fragile patient, walking along with an intravenous pump, or a medical team with a patient on a gurney, entered the elevator with the robot. We snapped a picture of my beloved elevator, now marked with the cautionary words. I could only wonder about the history of encounters (and complaints) that led the Stanford Hospital folks to post the warning. I imagined the reaction from the people asked to fabricate the sign, perhaps being moved to confirm, "I'm not sure I got that right. Can you repeat that?" I chuckled to myself in thinking about how visitors to the hospital might interpret that sign, after spying it for the first time--perhaps looking around suspiciously as the elevator doors opened. But the humorous reflection melted into a sense that one day, sooner than we think, we might take as commonplace notions of etiquette and rules of engagement with robots in our midst..."Be Kind to Passing Robots." "Allow Robots the Right of Way, Please." "Please Don't Confuse the Robots. They are Trying to Help." "We Apologize if the Robots Are Rude--They Really Mean Well." "Please Don't Tip the Robotic Waiters!" "Please Give Robotic Cars the Right of Way at Stops." "Please do not engage the robots unless they engage you first!"